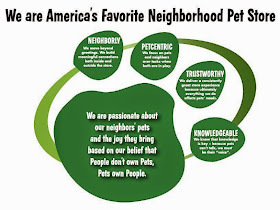 Pawsitive Impressions: Upper Arlington, Ohio Team Leader is Dog Nutrition Wizard! Upper Arlington, Ohio Team Leader is Dog Nutrition Wizard! Our neighbor called in to say how thankful she is for the team at this store; especially manager Cyndi. The neighbor has five rescue dogs who all have allergy problems and the neighbor has had such a hard time finding dog foods that fit their specific needs. Cyndi is extremely knowledgeable and helpful and has worked very hard to help the neighbor find the right foods for each of her fur kids. The neighbor has switched all of her dogs' foods with the help of Cyndi and her dogs are now thriving! Each animal has a different diet but the base for her dogs is a mix of Redford Naturals Salmon and Lamb varieties; and her dogs LOVE it. On every visit Cyndi and her team provide the neighbor with the best service she has ever received. The neighbor has worked in management all her life and could not be more impressed with this team. She says the younger team members are always so polite and focused, and they always insist in carrying out her items. The neighbor is so appreciative of this as she does have an illness that sometimes makes it hard for her to carry large items. The neighbor also wanted to comment on how clean and organized this store is, and that all of the animals look so healthy and happy! She wants us to know what an outstanding store this is; she drives 30 minutes out of her way to shop here even though there is a another pet store 2 minutes from her home. She will be a neighbor for life! Those are always great calls to receive - thank you, Lauren, for sharing this story with us!